As the current credit crunch deepens, your small business customers are looking for ways to tighten their belts while working smarter and more efficiently. A slew of changes tucked into Microsoft's Windows Small Business Server (SBS) 2008, released Nov. 12, could help them do just that. SBS 2008's new client access license (CAL) policy makes this version cheaper than SBS 2003 in many cases. The server product also features the latest and greatest that Microsoft has to offer, while making the whole thing easier for your customers-and you-to manage. Like SBS 2003, SBS 2008 is optimized for companies of up to 50 employees, although it can support up to 75 users. It's an all-in-one computing powerhouse, offering an inexpensive, easy-to-manage platform for everything from file and print to e-mail and Internet-based collaboration. But unlike SBS 2003, SBS 2008 is designed to run on 64-bit hardware platforms. SBS 2008 comes in two flavors. The one-server Standard Edition comes with Windows Server 2008, Exchange Server 2007, SharePoint Services 3.0, Windows Server Update Services (WSUS) 3.0 and integration with Office Live for Small Business, as well as free 120-day trials of Forefront Security for Exchange and Windows Live OneCare for Server. The Premium Edition includes all of the above but is designed for a two-server environment, and comes with an additional Windows Server 2008 license along with SQL Server 2008. The most noticeable change in the new version is its management interface. First, most general administration tasks can be done via new Windows Vista-like panels and wizards, making it far easier for even the most technically challenged administrator to stay on track. But for more expert administrators, such as an outside consultant, SBS also offers the Windows Management Console, which allows you to delve deeper into configuration and control details. The new version also manages both servers and clients and lets users tailor reports to the right audience: general reports for the typical small business owner or administrator, and more detailed reports for outside consultants brought in to address more complex issues. And all of those management tasks can be handled remotely, significantly improving efficiencies for small business owners who may wish to offload tasks to outside consultants. SBS 2008 also offers bolstered Internet and collaboration capabilities via its integration with Office Live Small Business. This lets users set up and manage Web sites and private online workspaces. In addition, the integrated SharePoint Services add to the overall collaborative capabilities of the product. Security is also improved in SBS 2008. ISA Server has been dropped for firewall and other security duties in favor of Forefront and Live OneCare. The move improves the simplicity of the configuration and brings the product in line with the security best practice of running firewalls and business applications on separate servers. And although Forefront and OneCare require users to come up with additional subscription fees, the added cost is minimal, considering the security headaches avoided via the far-easier-to-manage malware and virus protection. Another plus is that small businesses now have the option of purchasing the Premium Edition of SBS 2008, which lets them offload SQL Server to a separate server-something that wasn't possible in SBS 2003. Separating SQL Server functions from the rest of SBS's business tools ensure your customers get optimum uptime, performance and security, while taking only a minimal hit on licensing costs. Licensing is where SBS 2008 really shines. For the first time, SBS 2008 users can purchase not only 20-pack and five-pack CALs, but now they can also buy single CALs, ensuring that they buy only the licenses they actually need. Plus, the new version comes with five temporary CALs. This means that small businesses no longer need to buy extra CALs just in case. If they need to add a new user, they can simply add them via the temporary CAL, and then buy the associated CAL when time and money permits-as long as they don't exceed the five-user limit. Overall, the changes in SBS's CAL policy can result in users upgrading to SBS 2008 Standard and paying less than they were paying for SBS 2003. In a posting on the Microsoft SMB Community Blog, Eric Ligman, a Microsoft senior manager for Community Engagement and U.S. Partner Strategy, says that starting at the 15-user level-SBS Standard server with five CALs, plus 10 additional Standard CALs-the pricing for both versions is about even. But above 15 users, SBS 2008 becomes cheaper. Below 15 users, SBS 2003 has the pricing advantage, according to the chart. Beyond SBS, there still isn't much available for small businesses looking for this one-box-does-all approach. Small organizations can probably purchase enough Linux servers to do several jobs for an equal or lesser cost than SBS. But beyond the small-business showstopper-namely, that Linux is not Windows-open source systems present small businesses with difficulties in management and in finding reliable support, trumping any software cost savings. An interesting near-competitor to SBS, however, was also launched by Microsoft on Nov. 12: Windows Essential Business Server (EBS) 2008. Both products provide all of the key functionalities a small business needs in a relatively easy-to-manage platform. The difference is that EBS is designed more for the midmarket company with up to 300 employees-and its base pricing ($4,472 EBS Standard versus SBS's $1,089 Standard) and features bear that out. Another up-and-coming competitor is Google Inc., with its Apps Premier Edition. For a yearly subscription fee of just $50 per user account, your small business customers could offload all of their basic office productivity tasks to Google, which hosts and manages them in the cloud. Apps, which includes Gmail e-mail, Google Calendar, Google Docs, Google Sites and Google Video, is heavy on collaboration, and could be a good solution for small businesses that need constant remote connectivity to their business data. But the applications are fairly low-level compared with SBS, and may not meet the complex business needs of most organizations. 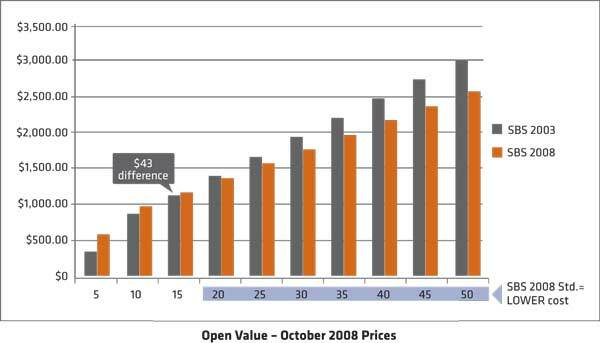 Microsoft put together this chart to show that while SBS 2008 is slightly pricier than SBS 2003 in small shops, it quickly becomes more cost-effective than the older edition with more than 15 users. This being a major Microsoft product, Microsoft provides a wealth of resources for sales and marketing. Plenty of ammunition is available on the SBS site at http://tinyurl.com/5n9l8r. There, partners can study a clear overview of the product, download an SBS 2008 demo or check out some SBS 2008 case studies. As part of the run-up to SBS's launch, Microsoft also added an online tool, called Solutions Pathway, designed to help partners assess customer deployments of Microsoft technologies and offer upgrade incentives to their customers. While SBS has always had the needs of the smallest businesses in mind, SBS 2008 really hits the sweet spot. Its innovative licensing, flexible deployment options, bolstered management and security and support for Microsoft's latest 64-bit server editions ensure that your small business customers have all the tools they need to be successful, at a price they can realistically swallow.